In honor of our sound bath for Atmosphere Concept Space at LA Design Festival, we are musing on the energy of creativity. Creativity connects us to our true spirit, and offers a doorway into our deeper being. It feeds our soul. Our ideas don't have to be perfect, they just have to come from within. Terence McKenna once said, “Stop consuming images and start producing them.” He often spoke about the imbalance in our society, placing a focus on consumption rather than creating, when what sets us apart from other creatures is our imagination. The truth is, we create by daring to dream, to fantasize, to follow the line through no matter how many pitfalls we encounter along the way. Expectations remove life and spirit from the creative process, and remove us, as creators, from the moment. There's an attempt to control something that is much larger than we realize. When we practice the art of letting-go, we allow something much bigger than ourselves to move through us, allowing ourselves to become intertwined with the spirit of the process. Join us for a very special sound bath on Sunday, June 11 from 4-5pm. 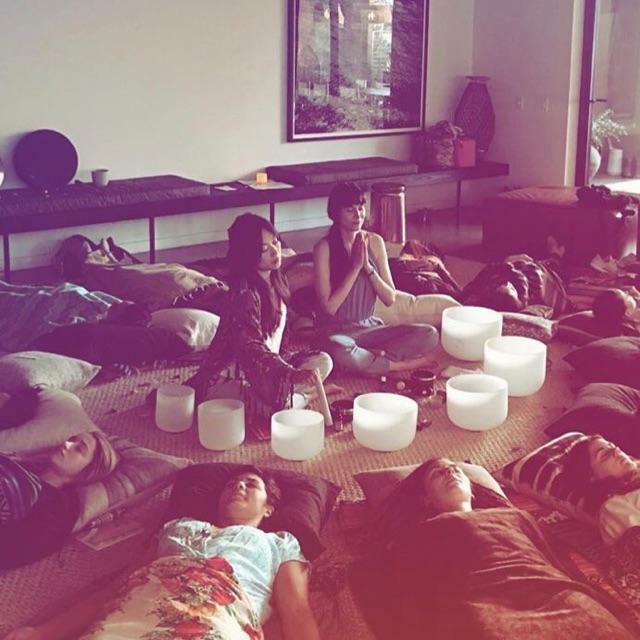 We will be collaborating with stream-of-consciousness artist, BUCKLEY for this sound bath, providing an energetic visual component to this event as we bring our attention from the external to the internal through an eyes-open meditation and then an eyes-closed sound bath meditation with crystal and Tibetan singing bowls, gongs, rattles, bells and drums.